Our DY-20 Series, High Tunnel Greenhouse Hoop Benders Frame Bending Tools were designed exclusively for the Homeowner Do it Yourself gardener. Weighing in at just 10 lbs, less than 36 inches long, bends a 20 ft wide hoop frame. 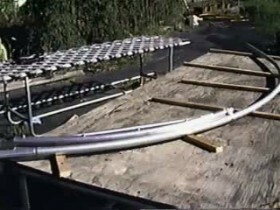 produces a 20 ft wide greenhouse hoop frame using three 10’ 6” lengths of 16 or 17 gage by 1 3/8” o.d. chain link fence tubing available at all home improvement stores. Complete bending and basic hoop greenhouse construction instructions are supplied with each bending tool.